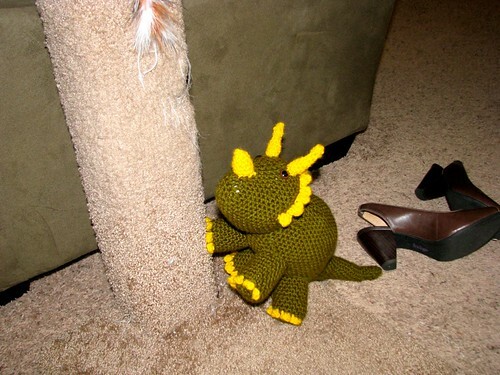 Oftengrumpy unless I'm knitting...: Dino-Mite! Absolutely adorable right? Right. It's a dinosaur! The coolest kind of dinosaur! A Triceratops! The pattern is so cute. 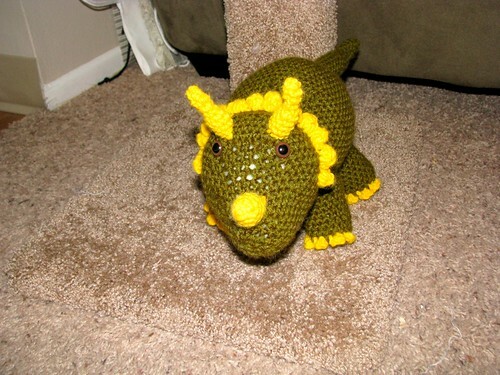 It's Triceratops Dinosaur (rav link) by Joanne Succari. My crocheting skills aren't that great... as you can see the stuffing shows through a bit on the face. It doesn't show as much as it looks like though. The flash really caught the white poking through. I love amigurumi toys! They are so wonderfully adorable. They're also pretty easy to make. single crochet is about the only thing you need to know, as well as how to increase or decrease. The yarn is pretty cheap. The body is Lion Brand Vanna's Choice 100% acrylic. The frill and toenails are Plymouth Encore 75% acrylic/25% wool. I bought the Vanna's Choice for $3 on clearance for this project and other fun amigurumi I have planned. The Encore was left over from a baby sweater. I could easily see myself getting wrapped up in making more cute crochet creatures. 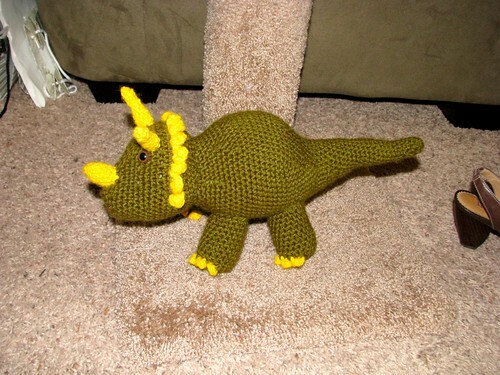 I gave this cute little lady, who has been named Lucy the Triceratops, to Ryan. Last week he took me to the Oregon Museum of Science and Industry because they had a T-Rex skeleton on display and we wanted to see it before the exhibit moved on. It was a fun dorky adventure and I wanted to make Ryan something cute to remember it. As a rule I don't think he keeps too many toys in his apartment, but Lucy is sitting on his bookshelf in his living room. The pattern probably would have only taken about two evenings, but I was busy while making it and didn't want to work on it in front of Ryan so it took about a week. What an adorable dinosaur! ...only 9 more WIPs... hahaha! (I laugh because I can sympathize).